Suspended scales, Loadlinks or Overhead weighing scales are generally known as Crane Scales and are often a useful way of weighing large and bulky items that are not able to be placed on a platform scale or weighbridge. 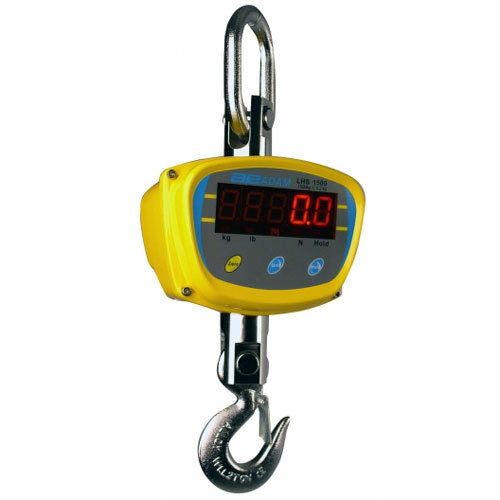 The weighing device is shackled to an existing overhead lifting device such as a crane in order to raise an item during the weighing process, usually the load is attached by the use of chains or lifting straps which then connect to the safety hook or shackle on the weighing device. 200 kg to 50 tonne mechanical crane scale. Case is a heavy aluminium alloy casting, tough enough to resist even heavy blows. Scale cases are coated with a baked-on powder paint process making them resistant to chips, scratches, rust and corrosion. Low cost crane scale. Capacities from 50 to 300 kg. Low cost crane scale. Capacities from 500 to 2000 kg. Low cost crane scale with capacities from 100 kg to 1000 kg. The lightweight (1.3kg) aluminium crane scale makes them very portable. The large bright red LED is clearly visible from long distances and a long battery life (over 120 hours continuous use) from 4 AA batteries. Crane scales from 300 kg to 2500 kg. 38mm red LED display, aluminium alloy housing and a 6V DC rechargeable battery - 150 hour life. Includes a seperate display with integrated radio module with a range up to 100 m.
Crane scale with capacities of 5 to 20 tonnes. Heavy duty crane scale designed to be used in the harshest industrial environments. 2.5 - 200 tonne capacity options with push button control for: tare, units (kg, lbs, kN & tonnes), peak hold and offset adjustment. 2.5 - 200 tonne capacities with licence exempt radio display. Range on standard Radiolink is 100 metres. Push button control for tare and zero.